HHT Nepal's Manaslu Larke La Pass 2019! 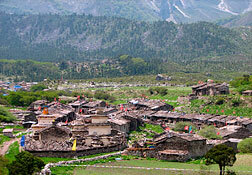 Overview: Join us to hike a fabulous section of the newly opened "Great Himalayan Trail." 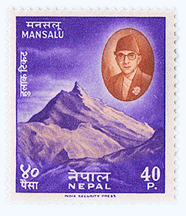 Manalsu is nestled between the Ganesh Himal Range to the east and Annapurna to the west. 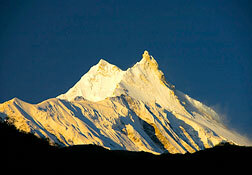 Here you'll find staggering peaks such as Mount Manaslu (8,163 meters) the world's fifth highest. The lower section of our route is where you will discover historic Gurkha villages and towns and learn about the 18th century Gurkha king who unified Nepal. 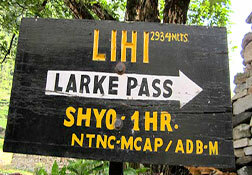 On this trek we cross the famous Larke La Pass (5,135 meters) to enter the upper Manaslu section bordering Tibet — a restricted trekking zone which helps preserve its unique culture. Leadership: Lok Tamang is from a small remote village (Maili) in the Solukhumbu region. He started as a porter and assistant guide prior to undertaking guide training in 2012 from the Nepal Academy of Tourism and Hotel Management (NATHM). More recently he completed a trekking guide refresher course through the Kathmandu Environmental Educational Project (KEEP). 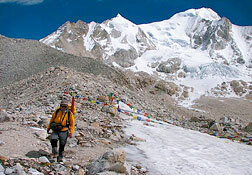 He has led treks to many areas including Annapurna, Dolpo, Mustang, Langtang, Manalsu, the Everest region and in Tibet. He was one of the main volunteers in HHT's effort to distribute emergency aid in Nepal after the 2015 earthquakes. Pre Trip Days: In transit from your home (Americans lose one day crossing the international date line). 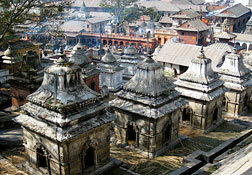 Fly to Kathmandu, Nepal. Your group leader or guide will meet your flight outside the customs hall after you deplane, collect your luggage and pass through immigration and customs formalities. Day 1: Group arrival in Kathmandu. 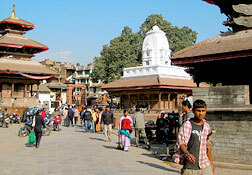 Your guide will meet your flight at Tribhuvan Airport in Kathmandu — waiting for you outside the customs hall. Transfer to a delightfully small guest house in Kathmandu's Thamel neighborhood. Here you'll find comfortable rooms with attached bathrooms (good hot showers), telephones, email, laundry service, a free safety deposit box and luggage storage. Our guests tell us they enjoy the hotel's location and friendly staff. Day 2: Today is a fine introduction to Buddhist as well as Hindu religions and you'll appreciate our guided sightseeing in the Kathmandu Valley. 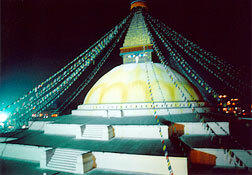 Places of interest include the Hindu temples and ghats of Pasupatinath and nearby, the Buddhist stupa at Bodhnath. Ghats are steps leading up from a river. You will notice the bathing ghats (where people wash themselves and their clothes) as well as the burning ghats, where Hindus cremate dead bodies in readiness for dispatch in the river Ganges. 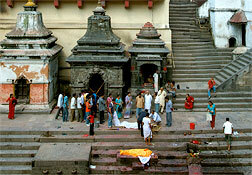 You'll find an important Shiva temple at Pashupatinath (Shiva is the great destroyer and creator God of Hindu religion). 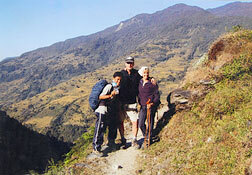 Day 6: Trek to Jagat. 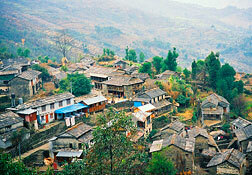 Continue trekking past fields of tobacco and buckwheat to reach Tatopani Village, named after the local hot springs (called "tatopani" in Nepali). These springs can be found at the center of this placid, terraced village. Enjoy some free time (while lunch is prepared) to nurse your tired muscles with a fine soak in the gushing, hot spring waters! You'll also enjoy a great lunch. 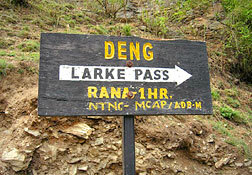 Day 7: Trek to Deng. After breakfast, today's trek begins on a long downhill section with a series of stone steps leading to the river. Then we clamber up a terraced hill to Saguleri — here we can see the impressive, Sringi Himal at 7,187 meters (23,573 feet). We pass the charming, paved village of Sirdibas, where its children are often selling oranges in season. Day 8: Trek to Namrung. Today our trail now enters much higher elevations and you'll notice our changing altitude reflected in the villages we pass. Houses are constructed with flat roofs and we discover more Buddhist monuments such as Mani Walls (carved stone walls with Buddhist prayers) and Chortens (small Buddhist structures). Day 14: Trek to Larkya La & Bimtang. Welcome to the most exciting and challenging day of our trek! We'll start early to avoid the bizarre local winds which increase later in the day. Post Trip: Same day return date for Americans crossing the international date line — to arrive home about midday. Travel Details: When arranging your flight to the meeting point, note that you must arrive in Kathmandu no later than day 1 and that you should not depart earlier than day 19. You are welcome to travel early or stay for extra days at the end. We can arrange additional nights at any of our hotels or guest houses for you. For those arriving early, staying late or wishing to extend their visit, we can offer airport transfers, guide services, car & driver, tours and accommodations to create a memorable and custom experience. Contact us with your specific interests and budget — we can help make it happen! Passport, Visa(s), Physicians Visit, Emergency Medical & Evacuation Insurance, Travel to/from Kathmandu, Nepal, Meals Beyond Above Itinerary, Beverages, Spending/Personal Money. 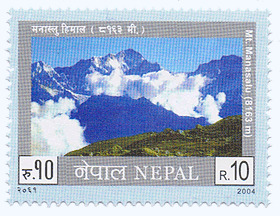 Strenuous: Usually involves high-altitude hiking along rugged trails and crossing passes as high as 18,000 feet. Weather can be variable and snowfields may be encountered. Daily hiking is extensive — sometimes for as much as eight or nine hours. 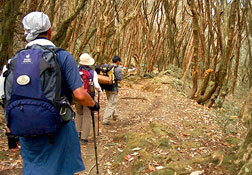 This trip is long in overall duration and are designed for experienced hikers who want to be challenged. No technical climbing skills are needed and days for rest are appropriately included, but overall this trip is arduous and meant for hearty hikers.